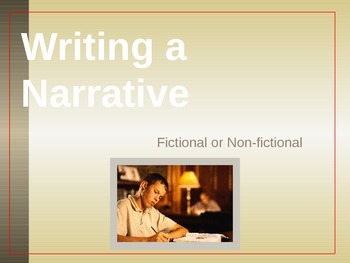 Integrated in this PowerPoint is a complete how-to for students. 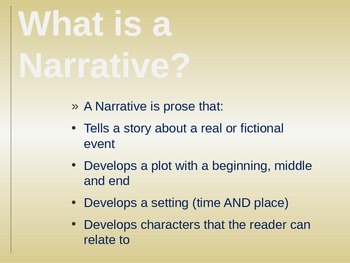 This Narrative Writing presentation is ready to use in the classroom to introduce students to the complete correct process to writing a narrative story, fictional or biographical. 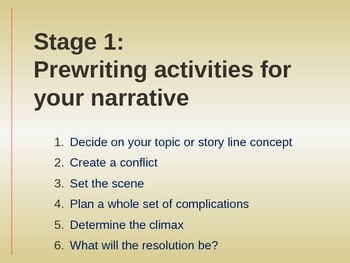 It includes the 4-stages in the writing process, 1. Pre-writing; 2. Writing; 3. Revising; and 4. Editing and Publishing. Enjoy.